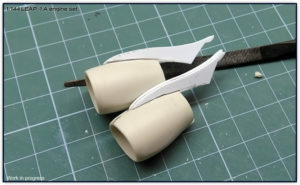 I’ve been able to start working on the pylons. My initial idea was to use the 50% of the PW pylons, but decided to start fresh. 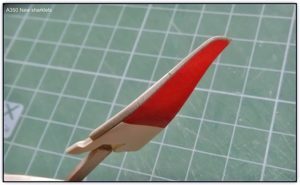 This is a very rough shape, pylons are glued to the wings and now I will put a little bit of putty for two reasons; 1- make sure that the fitting to the wing is 100% perfect, 2- finish to give volume to the pylon, when looking from the top, the pylon is thicker towards the inner side. 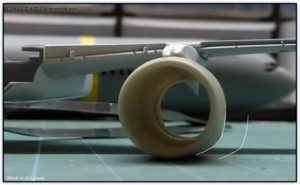 After putty is applied, I will then remove the pylon and continue sanding/giving a more three-dimensional shape. 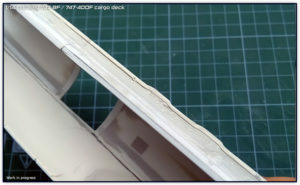 I am also going to do a light modification on the lump, I will try to make the edge just a little bit more sharp. 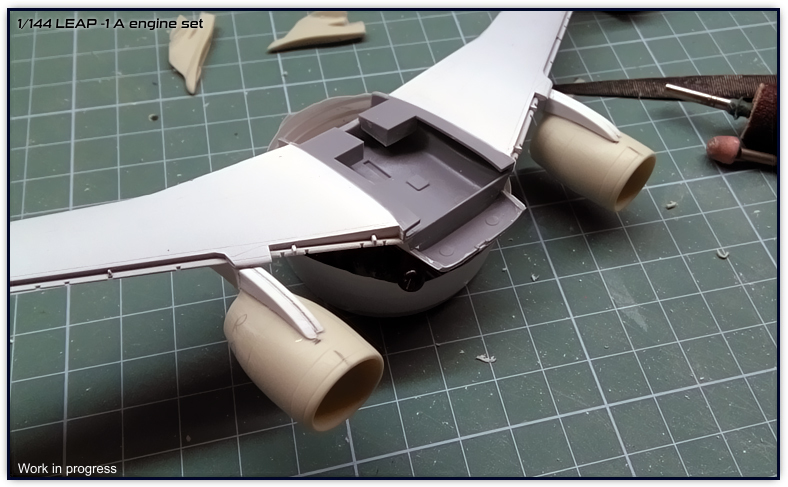 Although it may seem there hasn’t been a big update on this project, it has definitely been a very important step. 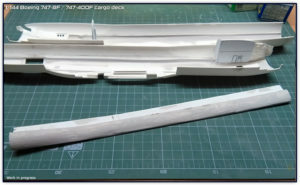 I have been able to prepare the unions on both fuselage halves for both; the ceiling and the deck. Filled up with putty the left top side of the fuselage in order for the ceiling to be placed in one position and one position only. 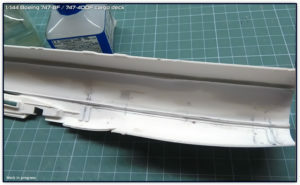 By using putty and from the inside of the fuselage, I put putty between the ceiling edge and the fuselage wall, upon putty dried, ceiling was removed and a mark was left for the ceiling to sit on precisely. 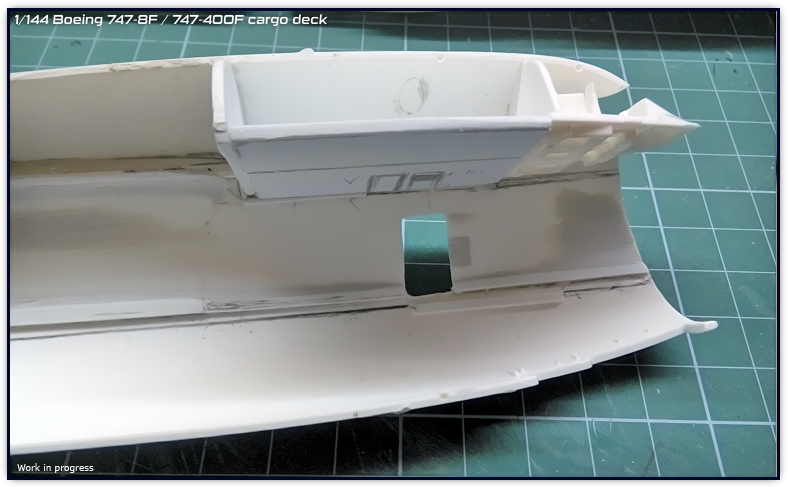 Having completed these steps and knowing that both the deck and ceiling fit inside, I am starting to consider the two remaining areas; the rear final deck section and the cargo holds. 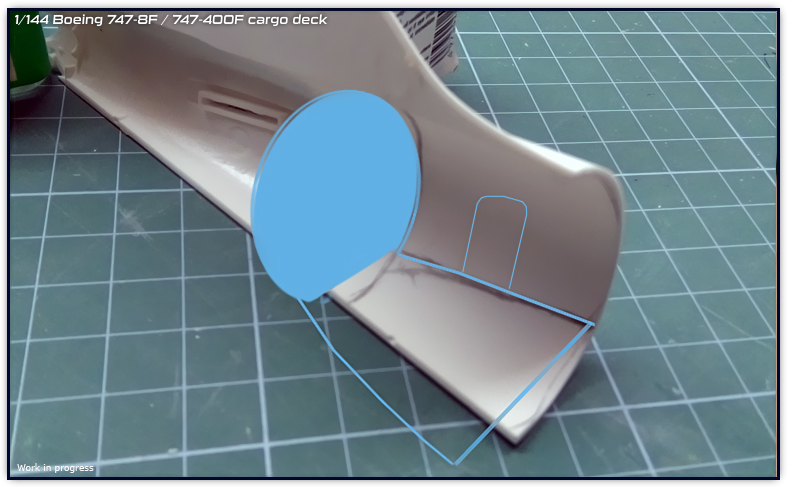 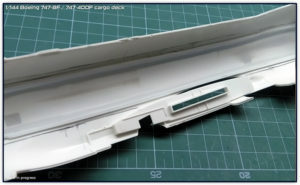 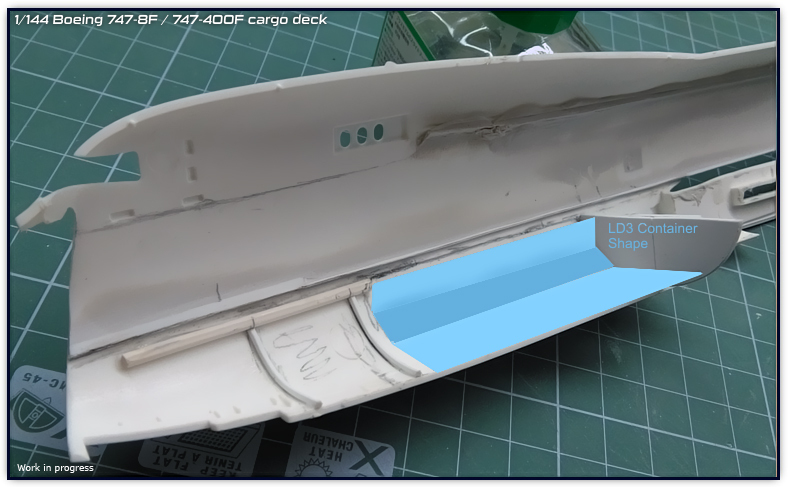 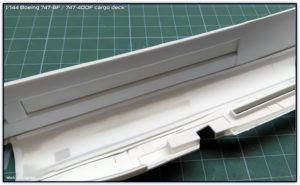 Cargo holds will definitely be easier to make since they have flat surfaces which appear to have the same profile shape of an LD3 container (or vice versa). 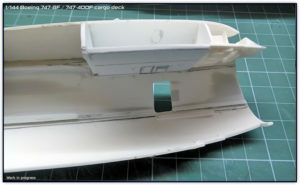 The step to do on this matter will be to open the cargo doors and set a floor inside leveled to the door, then from there make the two remaining walls. Because of the deck touches right on top of the cargo doors, the main deck will also be the cargo holds ceiling on the other side. I am also considering to leave the cargo holds “built in” the fuselage. 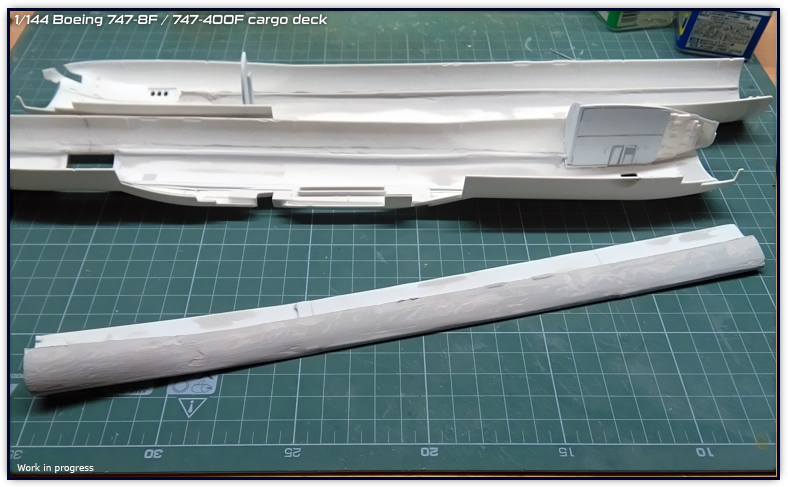 About the rear section deck; this will be a set of deck/ceiling/rear wall that will fit inside the tail cone in one position. 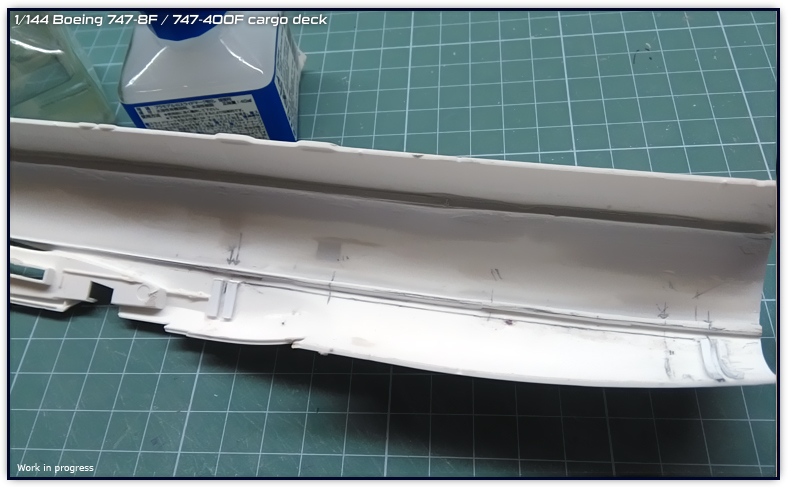 The main reason why I think to do this is because although the -8F does not have a pax door there, it does exist on the -400F and some BDSF models (pax converted to cargo). I am also starting to work on a minor cargo stuff which I hope to upload next week. 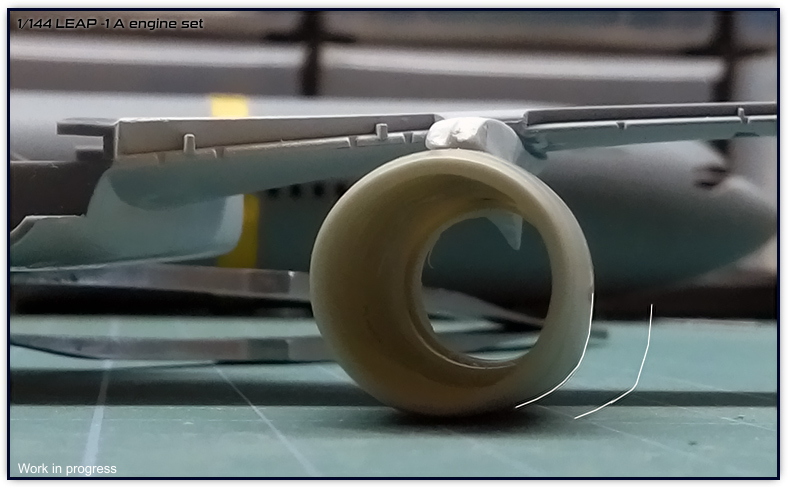 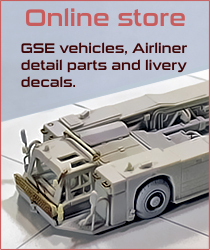 There are still some things that need to be done but I am currently decal testing these sharklets in order to start to design decals for all airlines, my intention is to serve these sharklets with decals to chose from similar to the GSE decals choice at the store. 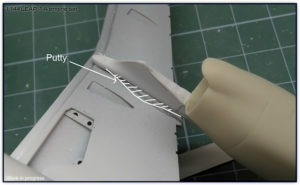 Although results proved me that printing two separate layers on top of each other is not fully viable due offsets, I double checked using two separate decals and in my opinion, two layers of white decal does look opaque white on a black surface. 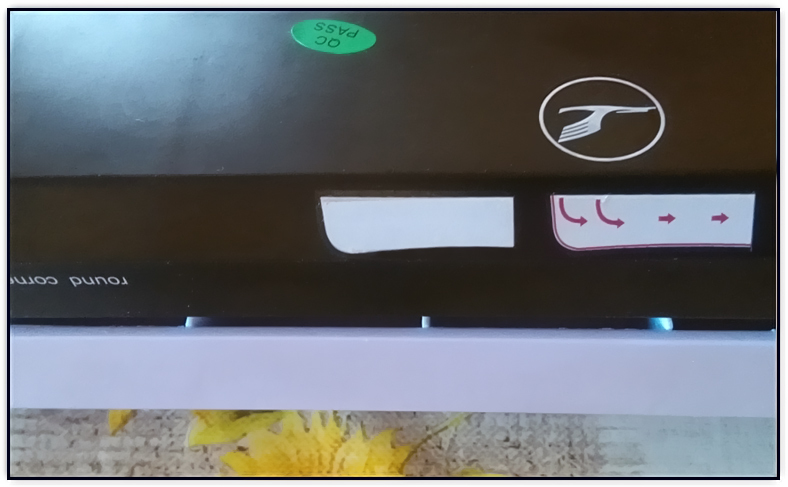 I first put one white decal, removed the excess of water and once it was settled, I placed the second white layer on top and the result is as seen on image above, decal was placed on a black plastic surface. Placing the two white layers when required (visible white) is actually easy to adjust the second decal to fit the first one and it does not take much time/effort. I take these matters very seriously because before selling these things I was a customer (still am) and I want these decals to be as they are expected to be, I would have not continued with them if I knew the white wasn’t possible but overall I am very satisfied with the result and I am currently working on new liveries, during the week I will put the current ones of the store back in stock again. As the 747-8F/-400F deck project is advancing, I wish to start soon the new cargo loader, before that I plan to release the LEAP-1A engines and the A350 new sharklets.